Questions still abound about Anthem‘s story, characters, and mysterious setting. While The Game Awards 2018 trailer doesn’t answer many questions, it does a good job of teasing how players might discover the answers in-game. Additionally, this all-new look debuts a new enemy, a force that has not yet been publicly shown. Who he is and how he fits into the narrative isn’t known. He seems a menacing threat, though, a character type that BioWare is famous for mastering in its storytelling. The villainous character featured at the end of the trailer serves as narrator. 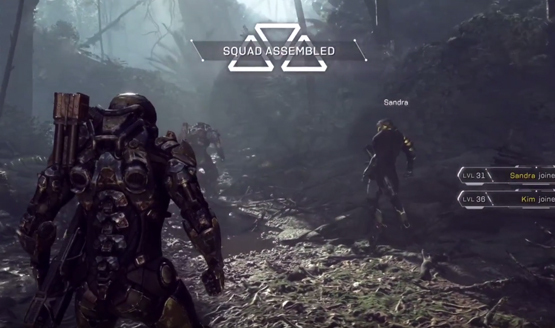 However, throughout the trailer’s duration, other characters speak as well, specifically about “the power of the Anthem.” Whatever the Anthem is, it destroys civilizations and breeds chaos that forced the world of BioWare’s Anthem to fight back with javelins and build walls to protect themselves from ruin. According to the narrator, “the Anthem still rages,” leaving him no other choice but to harness the Anthem’s power and eradicate their world’s continuous suffering. Based on the trailer alone, this character seems a sympathetic villain, one with whom the audience may find they empathize with. Does this mean the depth so often associated with BioWare characters will factor into the studio’s shared-open world shooter. It’s possible. Audiences will find out for sure in just a few weeks’ time. Anthem will arrive early next year on February 22, 2019 for the PlayStation 4, PC, and Xbox One. Before then, BioWare plans to launch a public demo on February 1st.